The embodiment of elegance, the Colonial Classics Collection by Home Styles provides a sophisticated retreat. Creating the kitchen of your dreams with beautiful craftsmanship such as poplar solids and cherry veneers, impressive picture frame moldings, and turned bun feet. Physically distressed using techniques such as worm holes and season splits adding further interest and character to this collection. Accessorized with antique pewter finished hardware and a cultured dark cherry finish. The Kitchen Island features a split top with .75 inch black galaxy granite, six storage drawers with side-mounted metal guides, two cabinet storage doors with adjustable shelves, and drop leaf breakfast bar. Breakfast bar extended top depth measures 37 inches. The Counter Stool features a contoured seat. Seat height measures 24 inches. Set includes kitchen island and two stools. Finish and measurements may vary slightly. Assembly required. Island Size: 48w 25d 36h. Stool Size: 17w 21d 37h. Colonial Classic Kitchen Island w/ Granite Top and Two Stools The embodiment of elegance, the Colonial Classics Collection by Home Styles provides a sophisticated retreat. Creating the kitchen of your dreams with beautiful craftsmanship such as poplar solids and cherry veneers, impressive picture frame moldings, and turned bun feet. Physically distressed using techniques such as worm holes and season splits adding further interest and character to this collection. Accessorized with antique pewter finished hardware and a cultured dark cherry finish. The Kitchen Island features a split top with .75 inch black galaxy granite, six storage drawers with side-mounted metal guides, two cabinet storage doors with adjustable shelves, and drop leaf breakfast bar. Breakfast bar extended top depth measures 37 inches. The Counter Stool features a contoured seat. Seat height measures 24 inches. Set includes kitchen island and two stools. Finish and measurements may vary slightly. Assembly required. Island Size: 48w 25d 36h. Stool Size: 17w 21d 37h. 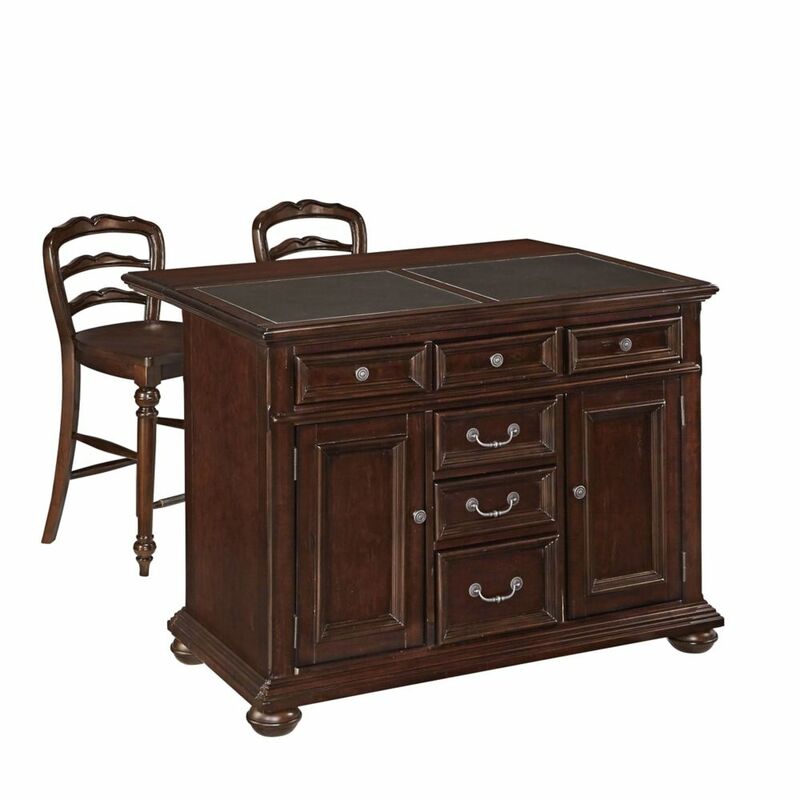 Colonial Classic Kitchen Island w/ Granite Top and Two Stools is rated 4.0 out of 5 by 1. Rated 4 out of 5 by Anonymous from Great island Love this island. It's hot Lots of roomy drawers and the cabinet space that we desperately needed. My only complaint would be that when I was installing the cabinet doors, on one side there were no pre drilled holes, so I had to drill them myself. One more...the screws that holds the wedges that hold the table up...way too short. I had to buy longer wood screws after the weight of the table top with a little weight from my son leaning on it pulled it out. I put them back up after drilling new holes and screws that were longer and it seems to work fine now. Other than that we love it!